Treatments are highly dependent on the kind of infection. 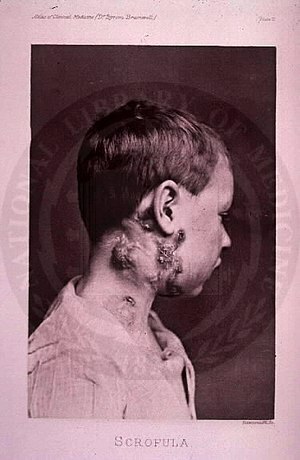 Surgical excision of the scrofula does not work well for M. tuberculosis infections, and has a high rate of recurrence and formation of fistulae. Furthermore, surgery may spread the disease to other organs. The best approach is to use conventional treatment of tuberculosis with antibiotics. The cocktail-drug treatment of tuberculosis (and inactive meningitis) includes rifampicin along with pyrazinamide, isoniazid, ethambutol, and streptomycin ("PIERS"). Scrofula caused by NTM, however, responds well to surgery, but is usually resistant to antibiotics. The affected nodes can be removed either by repeated aspiration, curettage or total excision (with the risk in the latter procedure, however, often causing unsightly scarring, damage to the facial nerve, or both).